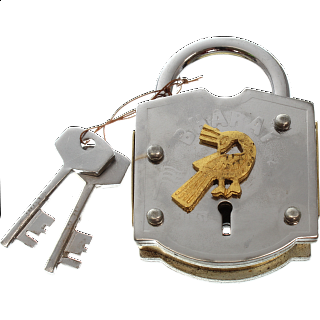 A metal Trick Lock which could fool you for an authentic padlock. The object is to just unlock it, but the mechanism is completely different from the locks you’re used to. You have to discover the trick that keeps it locked. You’re provided with two identical keys, but don’t expect to just put them in the keyhole and open it. A beautifully made puzzle decorated with a golden bird. 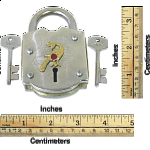 From our collection of PuzzleMaster Locks. 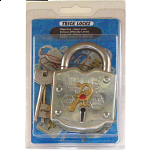 People who purchased Trick Lock 5 also purchased the following puzzles. This lock is ok, but not really that challenging. The solution is very straight forward and not thought provoking at all. the construction is good with a nice weight to it. 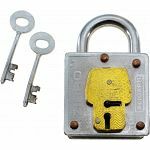 If you are only buying one lock I would avoid this one. 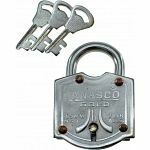 However, if you are interested in this one, I recommend buying the 6 pack of locks, if still available, for a better value.